Justin Kluivert. The name may sound familiar to you, even if you’re a sporadic watcher of the Dutch Eredivisie. Of course, Justin’s father is Patrick Kluivert, the famed Ajax and Barcelona striker. The days of Patrick’s career have passed and the family torch has been passed to Justin, a 19-year-old diminutive winger born in the beautiful city of Amsterdam. Bearing the flame once carried by his father, Kluivert now has a burning urge to prove himself after completing his first career transfer, to Italian giants AS Roma. The first step he took to make that goal a reality was to break into the Ajax team. At only 17, Justin Kluivert made his Eredivisie debut after rising through the Amsterdammers’ youth ranks. This past season, he asserted himself into the Ajax starting eleven, initially winning the trust of Marcel Keizer before proving to Erik ten Hag that the Dutch international debutant is no fluke. Kluivert scored ten and assisted five in his first league season as a true starter (transfermarkt). Played initially on the right flank of a 4-3-3, Justin eventually found his feet as Ajax’s starting left winger. In an Ajax side ridiculed for its lacking of tenacity and adherence to the promise of “beautiful football”, Kluivert was one of the only players to show a real ability to create the brilliant and applause-worthy performances in the side. Now, the young winger has gotten his move to AS Roma for about €17 million. Will Justin Kluivert fail to make an impact at his new Italian club, or will he join the illustrious list of successful Dutchmen abroad? Standing at 1.71 meters, or 5 foot 7 inches, Justin Kluivert is categorically not a physical specimen. He’s short and not particularly muscular. However, what Kluivert lacks in bodily strength he makes up for in physiological and technical proficiency. Oft positioned as a left winger, Justin Kluivert uses his great dribbling skill and jaunty acceleration to surge past defenders. As a right-footed player, he prefers to cut inside on his strong foot. For a team like Ajax, this provides many benefits. An attack-minded left-back will find himself plenty of space to run into on the left wing, while Kluivert’s inward movements can create numerical and positional superiority in the centre of the park. Combined with other technical passers, the Dutchman can pose a real threat to opposing defenders. Although Kluivert is quite conservative with his passing — 96% of his passes in the league were “short” passes, according to WhoScored — the winger is extremely aggressive on the ball and will often take on his marker one-on-one. Kluivert is not careless with his dribbling, often preferring to stop his move short if he sees an open teammate, but there is definitely an element of flair and surprise to his game. 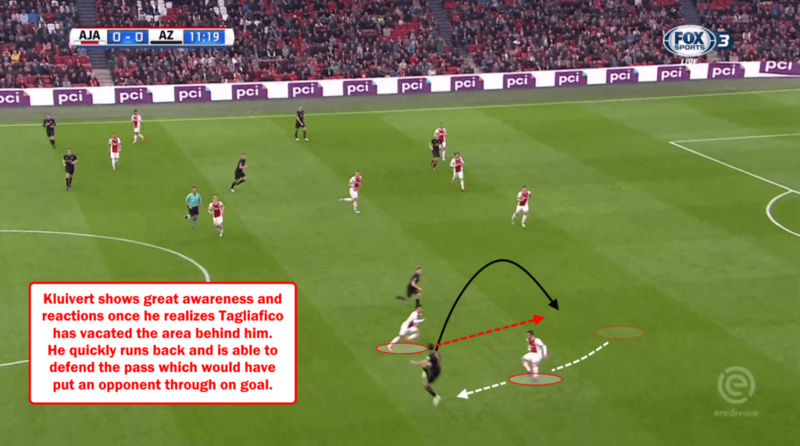 When Ajax were stuck against a defensive side, Kluivert or Hakim Ziyech could often be relied upon to make something out of nothing. Above all, Kluivert’s great strength is his ability to score off the dribble. When isolated on the left wing, he’ll try to fashion space by accelerating past his defender towards the box. On his right foot, Justin needs only a glimpse of goal to put a shot on target. It is yet to be seen how this skill will translate to an improved league with better defenders and goalkeepers. Overall, Justin Kluivert is a versatile winger comfortable with the ball at his feet, but also willing to play a small role in a possession-oriented side. Ajax are a team built of young talent, but the most important trait of an Ajacied is the ability to understand and create advantages. 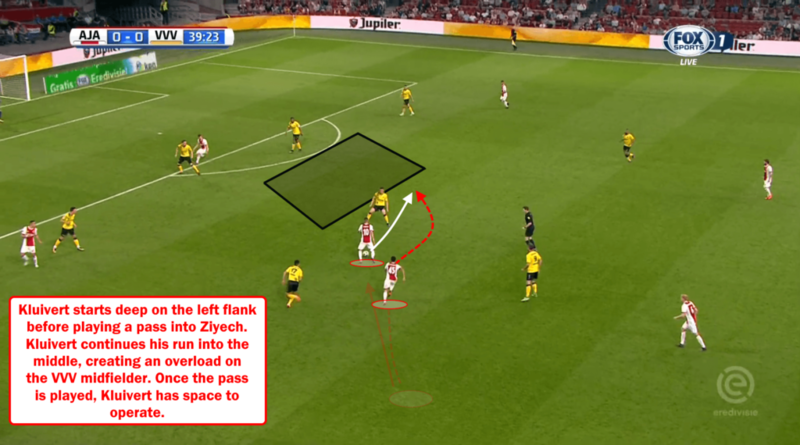 Ziyech, Donny van de Beek, and Frenkie de Jong are very capable of this in the midfield, creating passing lanes in congested areas of the field. But Kluivert is perhaps the best non-central player from last year’s Ajax side at fashioning numerical and positional superiority. 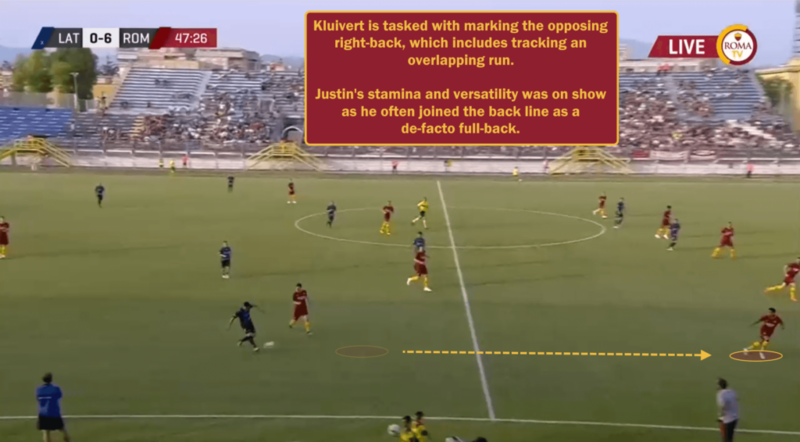 Whether looking to counter quickly, attacking an opposing full back, or dropping deep in the left half-space, Justin Kluivert is always looking to cut inside. In this sense, Ajax’s former #45 disrupts traditional sequences of possession by adding another player in the midfield or central final third. 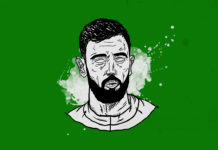 He often links up with Hakim Ziyech, a free-roaming creator, with a one-two pass to progress the ball towards goal. If a Roma midfielder can provide that creative presence when Kluivert is on the pitch for AS Roma, we could see very similar, successful overloads. Even when starting as a left winger, Justin Kluivert has a tendency to roam far away from his starting position. If space allows it, he will run across towards the right flank as a way to switch the play to the opponent’s weak side. Once again, we can expect numerical advantages when this is done successfully. 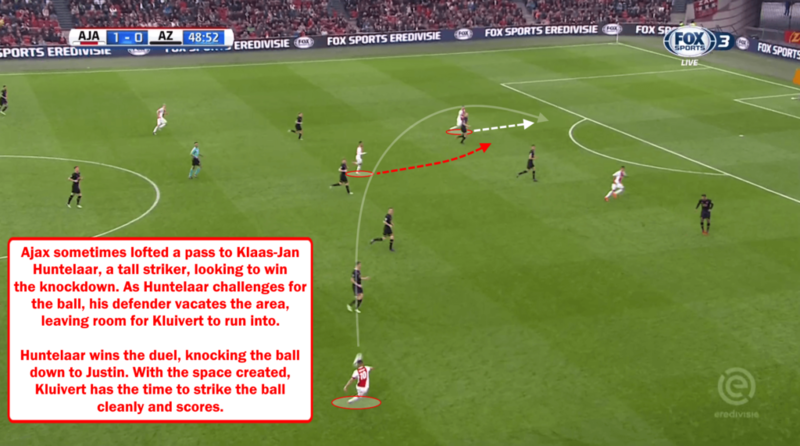 When play is stagnant and Ajax aren’t creating much, Kluivert will sometimes drop deep to receive a pass. We see this often in players like Luka Modric or Kevin De Bruyne — creative midfielders — but this can be extremely successful when done by a winger. 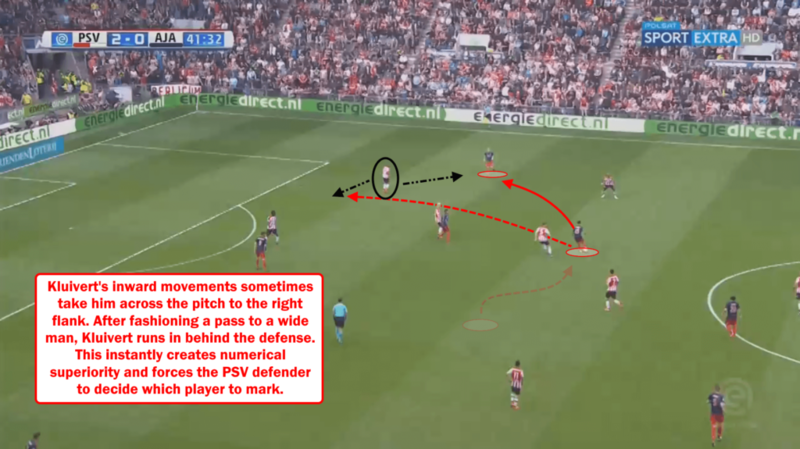 This allows the more creative midfielders to stay higher up the pitch, forcing the defenders to remain constrained and allowing Kluivert to take on his marker or pass inwards. Kluivert’s understanding of spacing and overloads make him a great asset in a possession-oriented attack. Yet when his team resorts to direct play, the 19-year-old is able still to succeed. For long periods of the 2017/18 season, Ajax played with veteran forward Klaas-Jan Huntelaar. A taller, more physical player than Kasper Dolberg, Huntelaar often thrives in aerial duels and more direct passing play. Huntelaar’s role sometimes mirrors that of Edin Dzeko at Roma, an even more proficient target man. While Dzeko operates as a passing outlet in the middle, Kluivert can run off the Bosnian behind lines. In addition, Kluivert’s versatility extends to the forward position where he sometimes played during his youth career. When a forward vacates his area, the Dutchman is comfortable slotting in and preventing the defensive line from closing down other players. Taking up a forward position allows Kluivert to show his incredible reading of the game. Using his speed, Roma’s new signing can run in behind the defence with rapidity. This is a product of having a fluid attack and allowing Justin to express himself on and off the ball. Justin Kluivert has even shown versatility while still playing on the left wing. Sometimes the winger is not involved in the buildup and, when play reaches the final third, is still positioned as a “traditional” winger. This is beneficial because it keeps the defence guessing and is yet another way to create positional superiority. Kluivert didn’t complete many crosses last season (0.8 per match) but the threat may cause a defender to overcommit and leave himself exposed to a dribble. Nearly half of Kluivert’s shots in the Eredivisie last season were taken outside of the box, mostly due to his threat from range. While most of his goals were scored from inside the box, a lot of these were just a yard or so inside. This is because Justin is extremely adept at beating his marker on the dribble before quickly shooting with his right foot. As opposed to trying to beat a defender to the byline before crossing, Kluivert is always looking for a chance to get inside as close to goal as possible. Like his former teammate Ziyech, “JK” sometimes rushes his shots. I wouldn’t expect a teenager to know exactly when to pick his shots and when to pass on them, so this isn’t much of a worry (yet). We know how unselfish Kluivert is when cutting inside before the final third, so a tendency to play a bit selfishly when the goal is in sight can be forgiven. Anyway, scoring with his right boot has almost become a trademark for the youngster; six of his goals (one in a cup match) last season came from a cut inside and shot with his right. 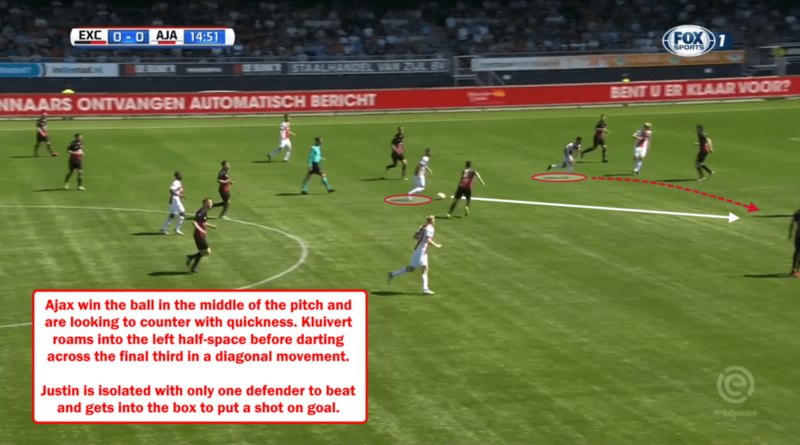 Everyone sees Justin Kluivert’s attacking traits — goal scoring, dribbling, passing, etc. — but there is more to his game than on-the-ball skill. When Ajax defended, Kluivert was an integral part of the team’s high press. 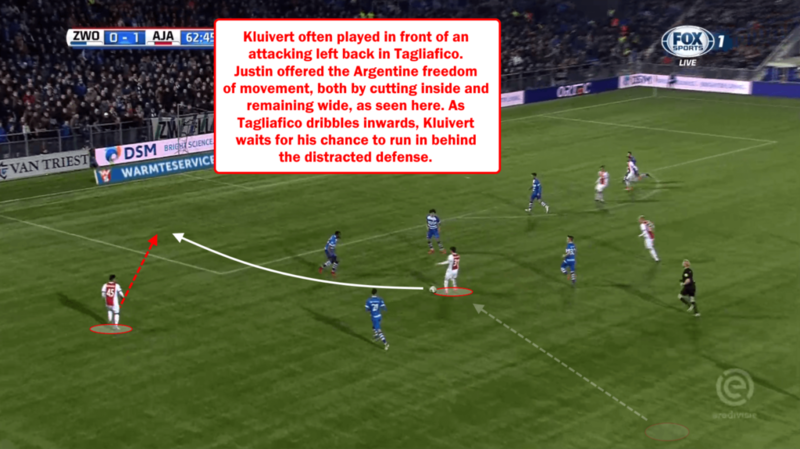 Ajax commit a lot of players forward when the opposition passes out of the back, so Justin has a lot of pressure to prevent forward progression down the left flank. Not only does Kluivert expend energy defending up the pitch, but he also does the dirty work of tracking back wide players. This is something we saw all season, but also in Roma’s pre-season friendly. 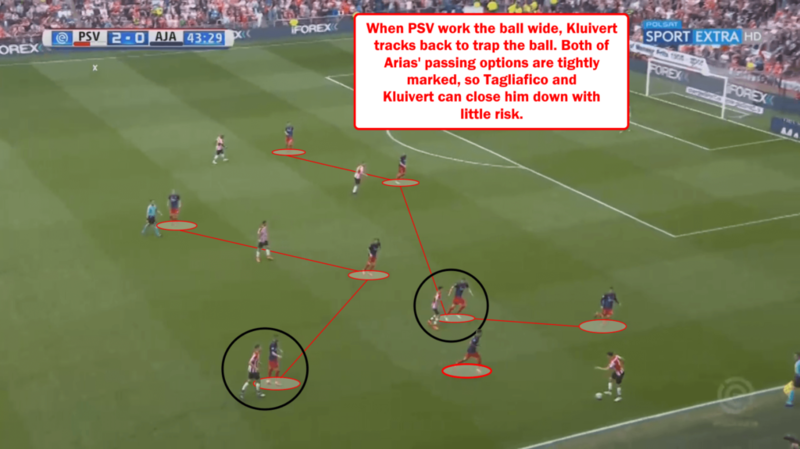 Kluivert does a great job of tracking back and, like former Eredivisie rival Hirving Lozano, sometimes joins the backline as a temporary left or right back. 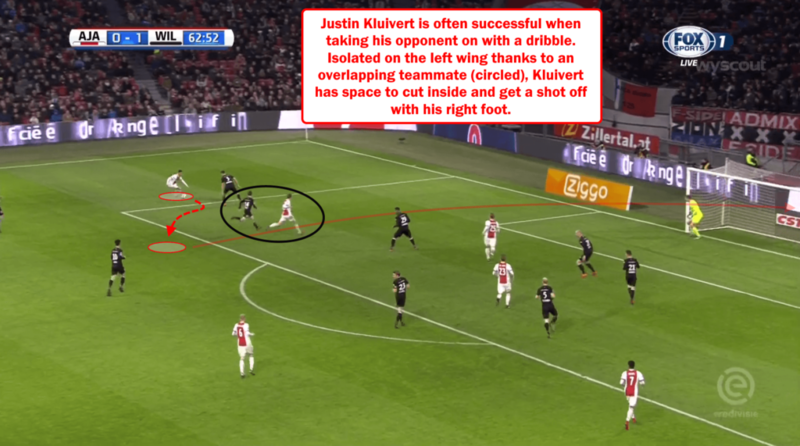 We talk about numerical superiority on the front foot, but Justin Kluivert can also create these advantages on defence. Especially when the opponent pushes up the flank, Justin tracks back to collapse on the ball. 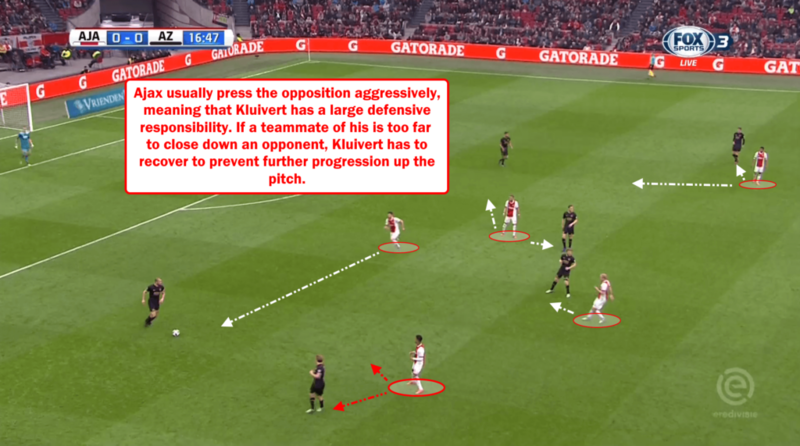 In a team like Ajax where the attack and midfield press aggressively, this is key to preventing too many passing options from exposing themselves in the opponent’s final third. In Roma’s pre-season match with Serie D side Latina, Justin Kluivert came on at halftime when Eusebio di Francesco made wholesale changes to his side. The young Dutchman was deployed as a left-winger, but he switched flanks with Stefan El Shaarawy for a long period of the half. This gave us an early glimpse at how Kluivert may operate in Di Francesco’s system in either of his preferred positions. 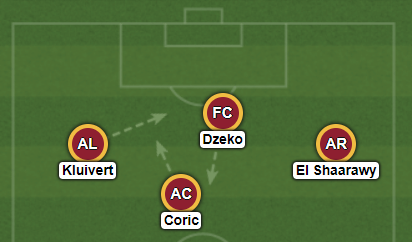 Roma set up in a 4-3-3 — their preferred formation for much of last season and one familiar to Kluivert — but the setup lacked a restricted structure. The front three were especially fluid in their movements, as represented by Kluivert’s inward movements and Edin Dzeko’s ventures into midfield. Attacking midfielder Ante Coric often overlapped Dzeko as well as playing up top when pressing, adding to the fluid feel of Roma’s formation. 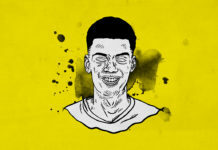 Justin Kluivert is no stranger to fluidity; Ajax is known across the world as a club built on the premise of Total Football, the tactical philosophy based on the fluidity of eleven players on the pitch. The winger earned the trust of three different managers by showing an understanding of these concepts and displaying them on the pitch. Di Francesco’s Roma looked versatile both on and off the ball. Going forward, a mix of long passes (vertical and horizontal) and recycled possession between defenders and midfielders were on show. This also suits Kluivert’s skill set. Justin is a good athlete with stamina and speed, allowing him to play with quick attacking patterns. He’s also a great passer and smart individual; his training at Ajax was on show in Lazio as he rarely lost possession and made great decisions. 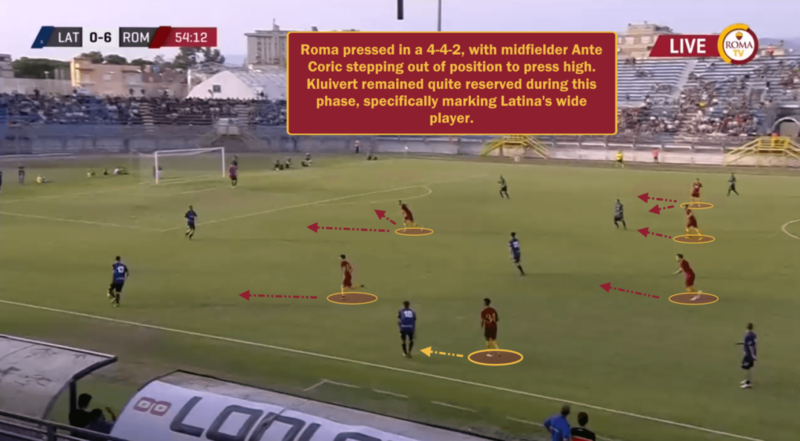 On defence, Roma followed a pattern of pressing not dissimilar to that of Denmark during the World Cup. Coric, the attacking midfielder, pushed forward to form a 4-4-2 pressing system. Kluivert’s duties were to mark whoever occupied his area, but he sometimes tracked back to join the back line. AS Roma, and Serie A especially, is a big step up for Justin Kluivert. He has proven himself to be a sparkplug on the ball, a diligent presser, and double-digit goal scorer, but this is all in the Eredivisie. Even in the Dutch league, many critiqued Kluivert for his inconsistency. There is a lot of truth to this, as only one of his goals and none of his assists were registered against teams in the top half of the table (transfermarkt). Roma finished the Serie A campaign in third, behind only the imperious Juventus and brilliant Napoli, and achieved a semi-final berth in the Champions League. Di Francesco has great talent at his disposal, and perhaps even greater squad depth. Both Diego Perotti and Stephan El Shaarawy competed for the starting left wing role last season, and with Cengiz Ünder looking to cement his right wing position, it is doubtful that Kluivert will get many starts next season. The appearances won’t come right away, but this move could be a lot better than critics seem to think. Kluivert will struggle initially to adapt to the smarter defenders, higher stakes, and more demanding teammates, but training with players like Daniele De Rossi and Konstantinos Manolas will help him develop into a smarter and more rugged player. 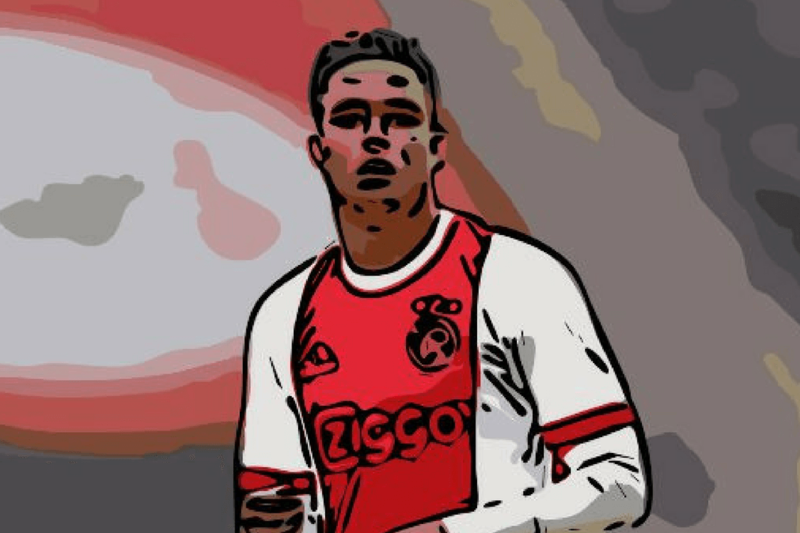 Justin Kluivert is an immense talent and can potentially go down as a generational player for the Oranje. 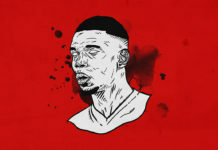 Stage one of his career — breaking into Ajax’s first team, cementing his place in the squad — was relatively straightforward. Now, stage two is becoming a first team player for a large European club like AS Roma. Before becoming a world-class star, he must complete step two. Based off all evidence to this point, Kluivert has the potential to do that.